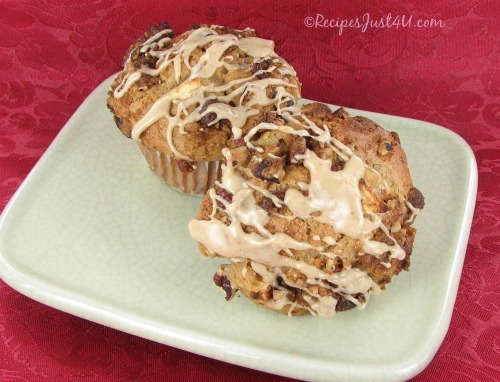 Mmmm…your house will smell delightful when you prepare these delicious caramel apple buttermilk muffins. 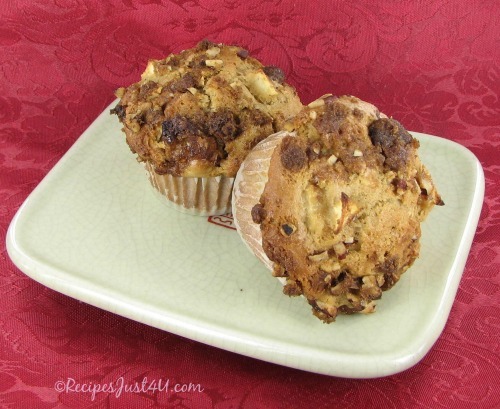 They are like a caramel apple all done up muffin style! They make a fast breakfast recipe, and are sweet enough to have as dessert! 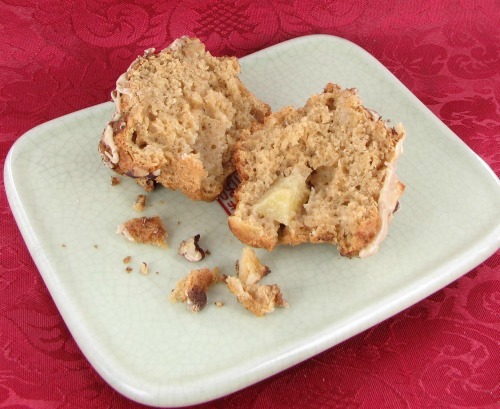 For a healthy muffin recipe, try these cinnamon apple muffins. They are only 102 calories each. When it is a cold, crisp morning makes me want to pull the blankets a little tighter and hit snooze so that I don’t have to leave the warmth of the covers. That is, unless I know these beauties are waiting for me in the kitchen with their little bits of apple in each bite. Normally, recipes say to fill muffin cups about 2/3 full. Not so for these beauties. I fill them almost to the top so that they will dome nicely. I want that yummy looking streusel to play center stage under neath the drizzle of deliciousness that is a caramel frosting. Many of my readers will know that I try to lighten up all of my recipes if I can. Baked goods sometimes take exception to this rule. I did use reduced fat buttermilk to save a few calories, but I’d rather eat half a real muffin than a whole one that has been messed up by trying to reduce the calories. For sweets, the real deal is it for me. I leave the main courses to the calorie counting. And lest you decide to forego the drizzle on the top to save a few calories, this is what you will be missing out on! If you enjoyed this recipe, also check out my caramel apple bars. They are super yummy, too. In a food processor, combine of all the streusel topping ingredients. Pulse until you have a crumbly mixture. (you can also do this in a bowl and combine that way.) Set the topping aside. In a bowl, mix together the dry ingredients and set aside. In a mixing bowl, combine the oil, brown sugar, and egg. When it is well combined, add in the buttermilk and pure vanilla extract. Add the dry ingredients to the wet ingredients and mix them well. Gently stir in the apple. If the batter seems to be a bit thin, you cam add a little bit more flour. The batter should be fairly stiff. Spoon the batter into the muffin cups filling them to the top so that they will dome well. Sprinkle the streusel topping equally over the muffins. Bake for 15 minutes at 400º and then lower the temperature to 350º F. and bake for an extra 12 minutes. While muffins are baking, prepare the drizzle mixture. Combine the brown sugar, butter and skim milk in a saucepan on the stove top. Cook over medium heat until well mixed. Remove and add the vanilla extract. While stirring, add the powdered sugar and mix until smooth and creamy. Mixture should drizzle easily, but should not be too runny. If necessary add more milk or sugar to get the right consistency. Test the muffins to see if they are done. They will spring back when lightly pressed or when a toothpick comes out clean. Cool in the pan for 10 minutes and then remove them and cool completely for 15-20 minutes on a wire rack. When cool, drizzle lightly with the caramel icing. 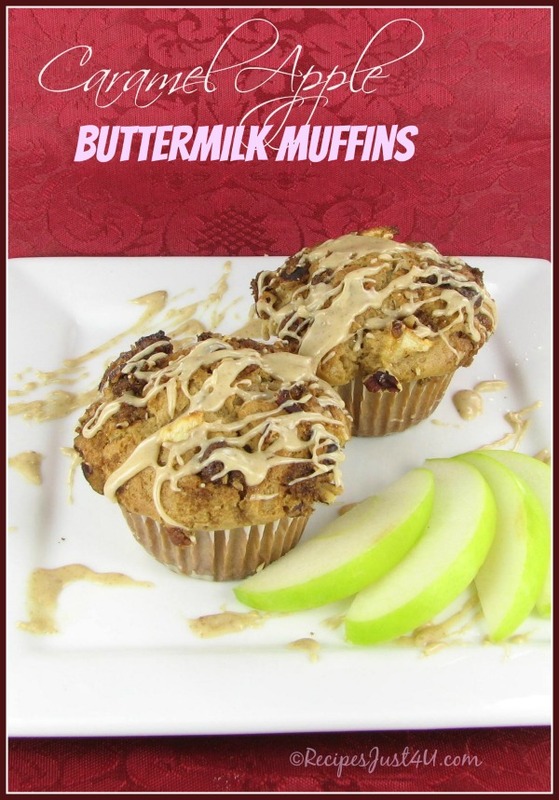 **when mixing in the apple, save a few pieces to add to the top when the muffins are in the cups. It makes the top of the muffin look great when cooked!